TrentCanal.com although unique, we present you with all the maps, coordinates, distancej between all locks from TheTrentSevernWaterway.com. Trent Severn spans a distance of 387 km (240 miles) and a rise of 180 meters (590 feet) above Lake Ontario and 80 meters (260 feet) above Georgian Bay at the Trent-Severn's highest point, Balsam Lake. 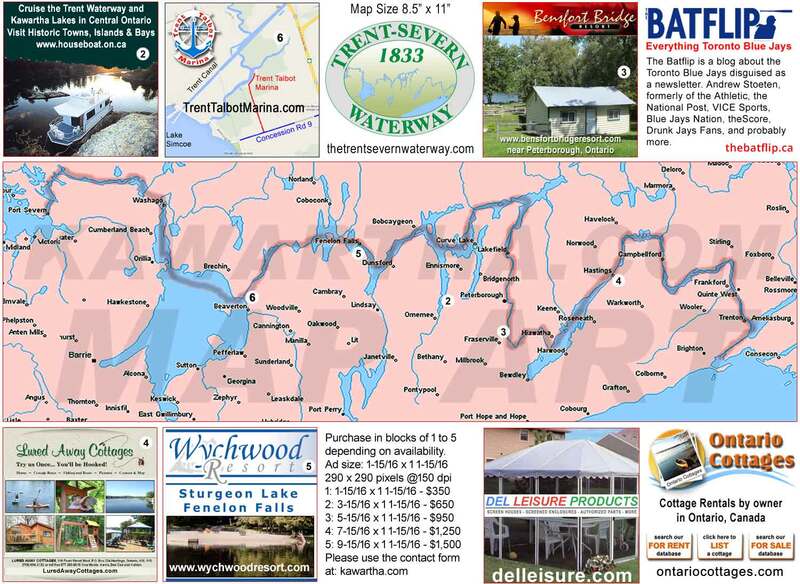 We offer businesses free advertising at our regional site: ShopKawartha.com that encompasses the Centtral Ontario Region. 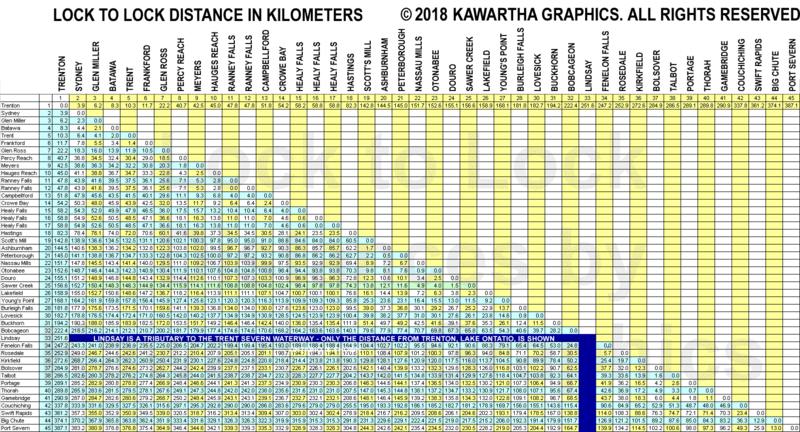 The start to finish time line spans eighty-seven years with the systems construction starting in 1833 at Bobcaygeon and finishing in 1920 at Port Severn, three hundred and eighty-seven kilometers from Lake Ontario. The Navigation channel runs a depth of six feet from start to finish. The locks vary in raising the water level some exceptions are; flight locks, the Big Chute Marine Railway with a lift of eighteen meters (58 feet), the Kirkfield Lift Lock with an average lift of fifteen meters (49 feet) )and the Peterborough Lift Lock (finished in 1904) with a lift of twenty meters (65 feet). Peaking at Balsam Lake at 180 meters (600 feet) above Lake Ontario and 80 meters (250 feet) above Lake Huron’s, Georgian Bay. Standard lock dimensions are one hundred and twenty feet long by thirty-two feet wide. The two exceptions are the lock 44, the Big Chute Marine Railway at one hundred feet long by twenty-four feet wide and lock 45 at Port Severn is only eight-four feet long and twenty-three feet wide setting the limit if you wish to traverse The Trent Severn Waterway from one end to the other. Two major upgrades were at Big Chute in 1960 and combining two locks at Burleigh Falls in 1968 eliminating lock 29. • The Trent Severn Waterway is Central Ontario's 387 kilometers of waterway utilizing 41 locks, a marine railway and 2 hydraulic lift locks. The highest point, Balsam Lake is 180 meters (590 feet) above Lake Ontario and 80 meters (260 feet) above Georgian Bay. • Navigation here is easy, all the key data is on one page. A click to the printable map or business directory or towns you pass by with quick links to their street map, grocery	shopping, LCBO and region. • Enjoy relaxing, activities or the sights of Central Ontario including the Peterborough Lift Lock or the Big Chute Marine Railway. • We use 387 km instead of 386 km because that is what we get things to add up to. • Balsam Lake is the highest point in the system, not Rosedale or Kirkfield. Kirkfield is 14.9 m below Balsam and Rosedale 1.2 m below. • The Kirkfield Lift Lock Chambers rise to one foot below Balsam Lake, the system works when Balsam fills this area in the chamber increasing the weight, allowing it to descend so the opposite chamber to can rise. The chamber coming down must always have more water (weight) for the design to function. • There is no lock 29 as two locks were replaced by one at Burleigh Falls. • Purdey's Mills aka Lindsay aka City of Kawartha Lakes, is a side branch of The Trent-Severn Waterway accessing Lake Scugog. Copyright © by TRENTCANAL.COM, All Rights Reserved,.